The Volume 2 CD cover. 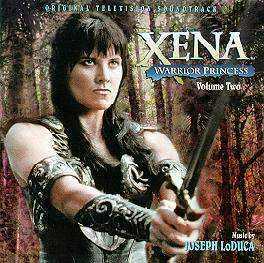 Just in time for the holidays *again* we have available on the Varese Sarabande label (VSD-5883) Xena: Warrior Princess Volume 2 , the Original Television Soundtrack. The music is composed by Joseph LoDuca, except for parts of the track "Homeland" which include Glede Ma Glede, a traditional Balkan harvesting song. There are 30 individual tracks on the CD, and it runs a little over an hour. Once again, at the time of this writing, I could find the music only available in CD, not cassette or vinyl (yes, there are some people, myself included, who still purchase vinyl). The CD appears to be well-stocked in a number of major outlets, and I was able to purchase two of them from differing online music stores. In this edition, the liner notes are a little better than the previous CD. In the pullout booklet there are attributions of the tracks to specific episodes (although it's a little amusing to note that INTIMATE STRANGER [31/207] was misidentified as INTIMATE STRANGERS, and another small error was detected when A NECESSARY EVIL [38/214] was called NECESSARY EVIL). The black and white pictures in the pullout booklet and the colour snaps on the back of the jewelbox are certainly representative of the music with two notable exceptions: there is a picture of Lucy Lawless as Miss Amphipolis, but there is no music from that episode on the CD [ HERE SHE COMES...MISS AMPHIPOLIS (35/211)] (at least, as attributed by the credits). Similarly, there are two pictures of Xena and Gabrielle from A DAY IN THE LIFE (39/215), but there is no music specific to that episode either. It really *is* in black and white! That being said, there are several glaring omissions from this CD. Although the music from DESTINY (36/212) was nominated for an emmy (and well deserving of that award) and although there are five tracks from that episode on the CD, *NONE* of those tracks contain the sailing montage -- the music and vocal accompaniment during the scenes where M'Lila is on the deck of the ship, before they make the ill-fated rendezvous with Caesar, Julius Caesar. Many will also be disappointed that while GIRLS JUST WANNA HAVE FUN (28/204) is represented with three tracks, none of them contain the "Bacchae Rap" or female vocalist who sings with the Middle-Eastern flavour. I'm sure many would have liked to hear Robert Trebor's rendition of "Miss Known World", but no music from HERE SHE COMES... MISS AMPHIPOLIS (35/211) is on this CD. It would have been nice to hear "Hower's Theme" from A DAY IN THE LIFE (39/215), as well as some of the delightful incidental music from that episode, but sadly, DAY is not represented. Also, I am *still* waiting to hear that stirring flute sequence at the end of RETURN OF CALLISTO (29/205) and INTIMATE STRANGER (31/207). The back of the pullout booklet. But the tracks that did make the cut are certainly worthwhile. We start out right away with the extended version of the Main Title, the one that contains the "Miklos Rozsa" flourish in it. We are then taken several notches down in "At Mother's Tomb", a quiet and emotional scene from REMEMBER NOTHING (26/202). From there it's a wild ride through Callisto Country with "Quicksand", "Squeal", and "Sword Play". After that we have an absolutely delightful rendition of Glede Ma Glede with instrument accompaniment in "Homeland", also from REMEMBER NOTHING . 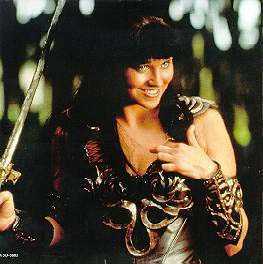 While we hear this track we share Xena's joy of a home unspoilt, yet feel in our hearts the sadness of a burden unlifted. After "Capoiera Fight" we come to the DESTINY (36/212) sequence of tracks, numbers 10 through 15. Again, the music is most notable for the absence of the sailing montage, but even so, this is wonderful stuff. I defy anyone to keep in their seat easily while listening to "Stowaway". Similarly, "To the Rescue" is also very stirring, as is "Fighting Destiny". We have another quiet moment in "Talk with Solan", followed by the full orchestration and choir version of "The Ballad of Joxer the Mighty". Children and adults alike will be delighted with a sequence of tracks from A SOLSTICE CAROL (33/209), especially at this time of year. We begin with the children singing "Solstice Night" and proceed through a series of tracks ending with "More Fun and Games/Feather Fight" which contains some very nice tubular bells work. We then get two very sobering tracks from THE PRICE (44/220), and two more from GIRLS (28/204). "Caught in the Current" is the only track from LOST MARINER (45/221), and in it I detect what could be an homage to Bernard Hermann. Now we're in the home stretch with only two tracks to go. "Callisto Becomes a God" from A NECESSARY EVIL (38/214) is edge-of-the-seat listening, and in the final track "Swamp Creatures/Imposter", I can literally see the ghosts in the mist, right up until I'm jarred back to reality with that tell-tale sequence of Callisto notes. And here the CD ends abruptly, with a definite sense of being unresolved. I can only hope this means more is on the way for a future release. The back of the Volume 2 CD. Click here for a review of the first volume of the XWP Soundtrack. The less you know about this guy, the better. Trust me.